Ever since finishing the first Burda Colourblock Dress, I have had various colour combinations on my mind for a second or even a third version of this pattern – Burda 02/2012, model 117b. As the pattern had been tested before, it was even easier and quicker to sew it up this time. The only time-consuming detail is changing the threads – when connecting different colour blocks, I use different colours of upper an lower thread accordingly. The size I cut is the same as always for Burda patterns – size 38. The material is ponte knit – exactly the same quality and weight of fabric in different colours. I think this is also the most difficult part in colour blocking – finding the same fabric in different shades (and more than 2!) is not always easy. Isn´t it amazing how the shoes can change the whole look? I love high heels, but due to my work and lifestyle I cannot wear them as often as I would like to. In March I will spend a short holiday in Paris with my mother and obviously the sportier look will be my choice. The edgy sneakers are from my trip to Portugal in September. I think the pattern contains endless options – in addition to playing with different colours, one could also combine the same colour but different textures or materials – say, black ponte knit and faux leather? This would also be a solution if the same fabric cannot be found in several colours, as I pointed out earlier. In winter and early spring we had a very rough time because of a serious health issue in the family and the general situation in crisis-hit Greece, so I didn´t have the time and energy even to look at Burda Style magazines for a couple of months, and of course when I finally came around, they had suddenly come up with some great patterns in February and March! I managed to order these issues from Abo Press, France eventually and it seems they will be my favorite Burdas for a long time. It was also nice to get them in English, it is way easier to follow the instructions, because although I read Greek, the Burda instructions are notorious and I can certainly decipher English better than Greek. I also loved Amanda´s version and actually I was pretty sure that I would not copy the Burda colour scheme. But as I was fabric-shopping in Estonia in summer, I saw a suitable jersey in lime and changed my mind. I made the last stitches on this dress on my birthday. The plan was to show the dress on the blog and then forget about it for some weeks at least, because it is too early for it here in Greece. But surprisingly enough, the chance to wear it came already yesterday! I had arranged to meet my friend Anastassia, who happened to be in Athens for the weekend (another christening!) at 10 AM for a coffee, and although getting up early in the morning has never been my strong side, it was even more difficult yesterday, because it was raining outside, the air was cool and getting out of my cosy bed seemed not an option. But then it dawned on me that this could be the first chance to wear my new dress and out of the bed I was! Because of the grey weather, the photos are not the best in terms of colour and clarity, but I hope they will do. The dress was quite easy to make, apart from some stupid mistakes I made during the process. The mistakes were mainly due to the fabric looking exactly the same on both sides and so I managed to sew up something like a colourful chessboard, before I realized I had joined the wrong backs and fronts. So, it was easy to make but took me longer than it should have. I omitted the tucks on the shoulders, as I liked the way they were without them and used an invisible zipper instead of the exposed one that the pattern calls for. I like the exposed zipper idea in general, but because I used it on one of my dresses already, I decided against it this time. Another change that I made was omitting the snap fasteners in front. Since the dress has a zipper on the back, I don’t see a reason for leaving the front open at all. So the final stitches I made, was sewing the front yellow piece onto the beige from the inside, on the outside it still has the overlapping effect. I feel that this way the dress fits much better as well. I cut size 38 and the fit was perfect, which was a relief, because otherwise it would have been difficult to make the colour blocks run smoothly at the side seams. The hemming was done by hand, so the stitches are not visible on the outside. I am thrilled with the dress, because it is SO comfortable and I think it can be dressed up and down very easily by changing the footwear. Yesterday I wore it with black/silver leather flats in the morning and since the shoes got soaked, I ended up wearing the dress in the afternoon with wellies (rainboots), to meet another friend! The wellies were a bit extreme I guess, but I hate to have wet feet, so I didn´t really care. 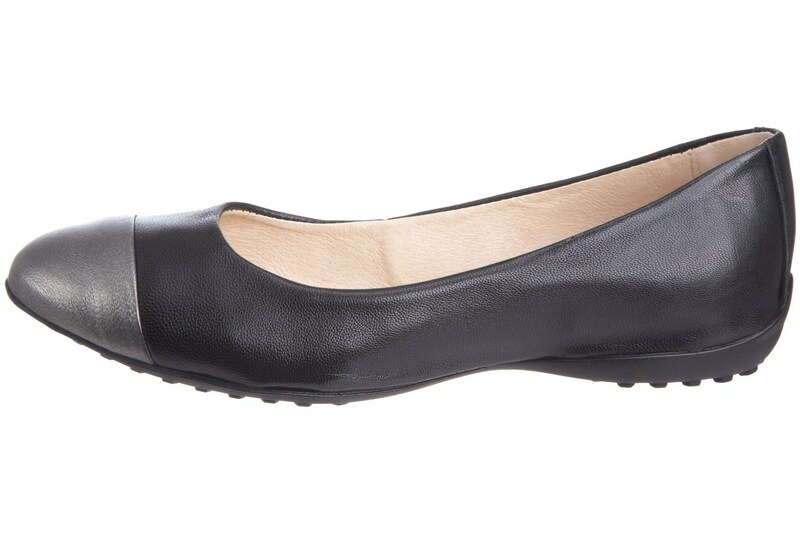 The shoes that can be seen in the photos are Pump & Circumstance Nadine leather flats, very comfortable and although I purchased them last year from Amazon, I have noticed that metallic cap-toe shoes are around a lot recently. I guess the silver leather toes of my shoes kind of fit the trend as well! I don´t know why really, but the pewter-silver footwear seems to be the best for this dress, maybe because of the grey skirt-block. By the way, I am so happy with the outcome, that I already got fabric to make the same dress in another colour combo! But that will have to wait a little, since right now I am working on Stefania´s dress and keeping fingers crossed for a good result!